For a couple of weeks now I've been extensively researching the history of downtown Louisville for an article I'm writing about one specific intersection. In the course of my research, I've learned a lot about the era of "Urban Renewal" that quickly and irreversibly changed the urban landscape. Starting in the 1950s and continuing on until the 1980s, Louisville city government took control of and then demolished more than one hundred city blocks of existing buildings to make way for civic structures, limited private development, housing projects, but mostly parking lots. That there exist in many communities in this Commonwealth slum areas and blighted areas...which constitute a serious and growing menace, are injurious and inimical to the public health, safety, and welfare of the people of the Commonwealth, and are beyond remedy and control solely by regulatory process in the exercise of police power. In other words, old buildings and existing urban structures were so totally beyond repair that the government must have the power to eliminate, en masse, these slums and blighted areas. Thus, city and state government, through eminent domain, could seize private property and flatten it, then prepare it for sale to private developers or retain it for the construction of publicly-owned civic structures. 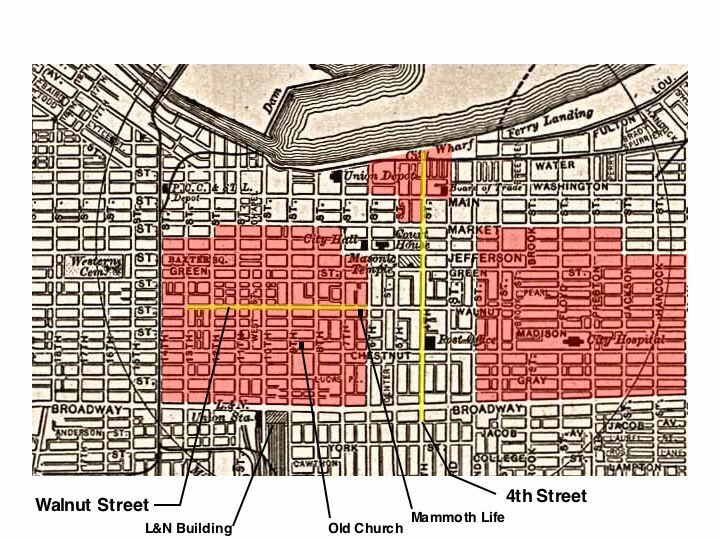 In Louisville, the primary targets of urban renewal were two large areas: one to the west of Sixth Street and the other to the east of Second Street, both between Market and Broadway. The eastern section, once a bustling urban neighborhood with thousands of residents, was demolished and replaced with a medical complex, I-65, and a white housing project called Clarksdale. In the west, the traditional black enclaves of the Walnut district and the Russell neighborhood were crushed under bulldozers, their residents expelled to new housing projects or other areas of the West End. The full story of Louisville urban renewal is a long one, involving racism, greed, a lust for power, and delusions about the supremacy of automobiles and the economic viability of suburban expansion. But what has piqued my interest was the use of language to further the goals of the renewers. Specifically, the words "slum" and "blight." "Slum area" means an area in which at least one-fourth (1/4) of all buildings or a predominance of improvements which by reason of dilapidation, deterioration, age or obsolescence, inadequate provision for ventilation, light, sanitation, or open spaces, high density of population and overcrowding, or any combination of such factors, are unsafe or unfit to occupy; are conducive to ill health, transmission of disease, infant mortality, juvenile delinquency, or crime: injuriously affect the entire area; or constitute a menace to public health, safety and welfare. A slum area may include lands, structures, or improvements, the acquisition of which is necessary in order to assure the proper clearance and redevelopment of the entire area and to prevent the spread or recurrence of slum conditions thereby protecting the public health, safety, and welfare. So there you have it. As long as the government determines that an entire area is vulnerable to "slum conditions," which may consist only 25% of actual "slums," the entire area can be seized and bulldozed. That's extraordinarily convenient if you have an undesirable group of residents you'd like to move away from the more civilized downtown area, or if your developmental vision of the future requires a lot of open space. What resulted, from the 1950s all the way to the 1990s, at least, was an emptying of crowded downtown neighborhoods -many of which were only slums by association - to make way mostly for parking lots. The architectural legacy of Louisville, dating from as far back as 1800, was bulldozed en masse and thousands of residents were relocated. These actions were upheld as lawful by the Kentucky Supreme Court case of Miller v. Louisville, 321 S.W.2d 237 (Ky. 1959). "Blighted area" means an area (other than a slum area as defined in this section) where by reason of the predominance of defective or inadequate street layout, faulty lot layout in relation to size, adequacy, accessibility, or usefulness, submergency of lots by water or other unsanitary or unsafe conditions, deterioration of site improvements, diversity of ownership, tax delinquency, defective or unusual conditions of title, improper subdivision or obsolete platting, or any combination of such reasons, development of such blighted area (which may include some incidental buildings or improvements) into predominantly housing uses is being prevented. KRS 99.340(2). Just as with "slums," the government had merely to declare an area "blighted" to be able to seize a neighborhood and bulldoze it to the ground. Emboldened by the U.S. Supreme Court case of Berman v. Parker, 348 U.S. 26 (U.S. 1954), Kentucky courts became widely deferential to legislative determinations of "blighted" and "slums," and property owners were left with no choice but to accept whatever the government paid them to get out. That is, until 1990, when the definition of "blighted" came before the Kentucky Supreme Court once again. As part of its planned expansion of Louisville International Airport, the city of Louisville passed several ordinances declaring the suburban Prestonia, Highland Park, and Standiford neighborhoods as "blighted." These ordinances allowed the city to relocate the residents and demolish their homes, under the authority of the Urban Renewal and Community Development Act (discussed above). The neighborhood associations opposed the ordinances. The city's ordinances were declared constitutional at the trial court level, and that decision was affirmed by the Kentucky Court of Appeals. But the Kentucky Supreme Court saw things differently. The single finding in each of the Ordinances relating to a specific fact indicating blight is "the area is adversely affected by both airport and traffic related noise and other environmental conditions which render it unfit for residential use." Noise is not one of the enumerated conditions in the statutory definition of blight. Even if we were to assume that noise could reasonably be linked to one of the enumerated factors constituting blight, there is not "substantial evidence" in the record of a noise problem rising to the level of safety or such that it is preventing the use of the area for housing. Merely establishing a large administrative and legislative record does not entitle a legislature or administrative agency to declare an apple to be an orange. The record may be replete with expert testimony on similarities between the fruits; however, a legislature or administrative agency, regardless of the size of the record it establishes, cannot lawfully make such a declaration. To by legislative fiat declare an object to be something it is not is such an abuse of discretion as to be arbitrary. The point here is that the definition of a word like "slum" or "blight" can mean the survival or the destruction of homes, of businesses, of entire neighborhoods and districts of large cities. Once again, language matters. *Ultimately, the neighborhoods slated for demolition as part of the airport expansion settled with the city for several million dollars, and the few remaining residents were relocated. Today, the neighborhoods either sit empty as vacant lots and unused streets, or they have been built upon for airport use.